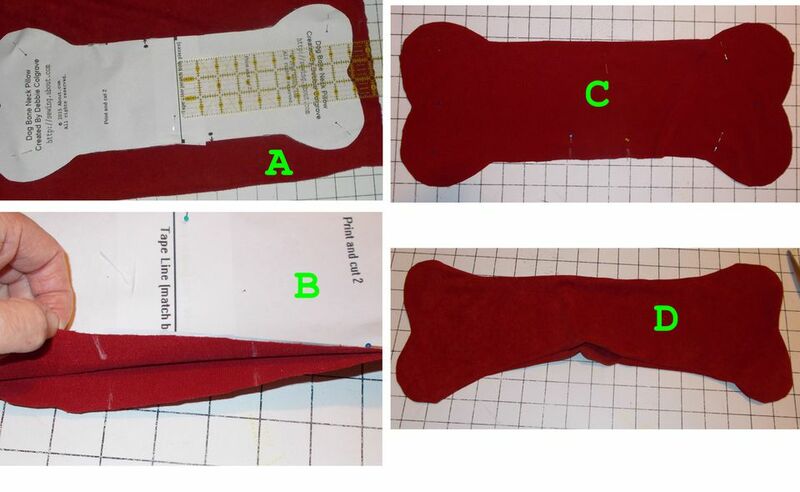 This is a simple sewing pattern for a bone-shaped neck pillow. It can be hand sewn if you don't have a sewing machine. Using a machine will finish this project in no time. Anyone who travels frequently knows how crucial neck pillows can be to making a long journey more comfortable. Neck pillows a great anytime you need just a little more support, such as relaxing on the couch after work. They also make for cute accent pillows. The dog bone pattern makes this a great gift for the puppy lover in your life or just to keep for yourself. You can quickly put these together to sell at a craft fair or even use as party favors. For a cozy travel pillow, you might choose velour, which is fuzzy and resembles velvet. Or, polar fleece is an excellent choice that is comfortable and also easy to work with as the cut edge does not fray. But you can also pick fun printed fabric to match your favorites sports team or interests. The pattern itself is a simple half of a dog bone, split horizontally through the middle (short axis) of the bone. It is easy to make this on two sheets of paper and then tape them together to produce the pattern. You can even free-draw the pattern if you desire. Tape the two pattern pieces together along the tape line. Make a dot even with the other dot on one side of the pattern so that you have two dots on one side edge. It doesn't matter which side edge. Cut two out of the fabric, using the tape line as a grainline guide and keeping it an even distance from the selvage. Transfer the dot markings to the fabric. Pin the fabric together, with the wrong sides together, and use a 1/2-inch seam to join them. Leave open between the dots on one side edge. Make clips into the seam allowance at curves and "V's" so that the seam will lay smoothly when it is turned right side out. Never clip through the seam allowance at the exact same point. Instead make the clips through one layer at a time, next to each other but not exactly in the same location because that could weaken the seam. Your pillow is now ready for you to use or to give as a gift. You can lengthen or shorten the pillow by varying the overlap of the pattern pieces where you tape it together. The amount of support the pillow will give varies based on how much stuffing you put in it, more stuffing will make a thicker pillow. You can make a reduced size version of this pillow as a dog toy. Dogs love toys with squeakers inside. Simply add the squeaker in with the stuffing and you'll have a noisy toy your pet will love.